Since the announcement that Amazon would be choosing the city that would host its second headquarters by the end of the year, competition between contenders has been heating up. 6sqft reported last month that Newark, still in the running along with Los Angeles, Denver, Miami, New York, Boston, three sections of the Washington, D.C., region and Toronto, approved a shiny new incentive in the form of ordinances offering nearly $1 billion in payroll tax exemptions to companies that create at least 30,000 jobs and invest $3 billion in the city over 20 years. Now, Jersey Digs reports that a group consisting of local residents and a California-based architecture firm have come up with a snazzy proposal for Amazon’s HQ2 that includes a location and designs for a futuristic complex that would include Newark’s tallest towers. Top: Portion of HQ2 campus seen from the street-facing south; Bottom: Looking west from Harrison from Passaic River’s east bank. Renderings by Heller Manus Architects via Jersey Digs. Fifth Avenue North Partners, headed by Jim Bardia and Joel Levin, has revealed some designs by Heller Manus Architects, the firm who designed some of San Francisco’s tallest buildings–including the San Francisco headquarters of Facebook and Pinterest. 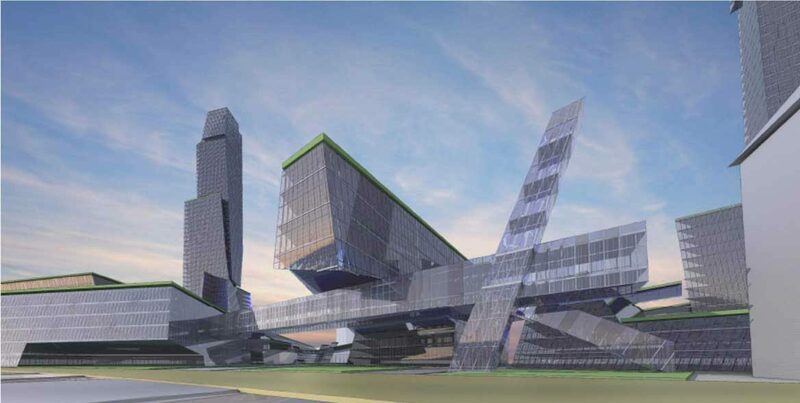 The proposed HQ would be a huge energy-efficient complex near Interstate 280 that would span both sides of Broad Street. 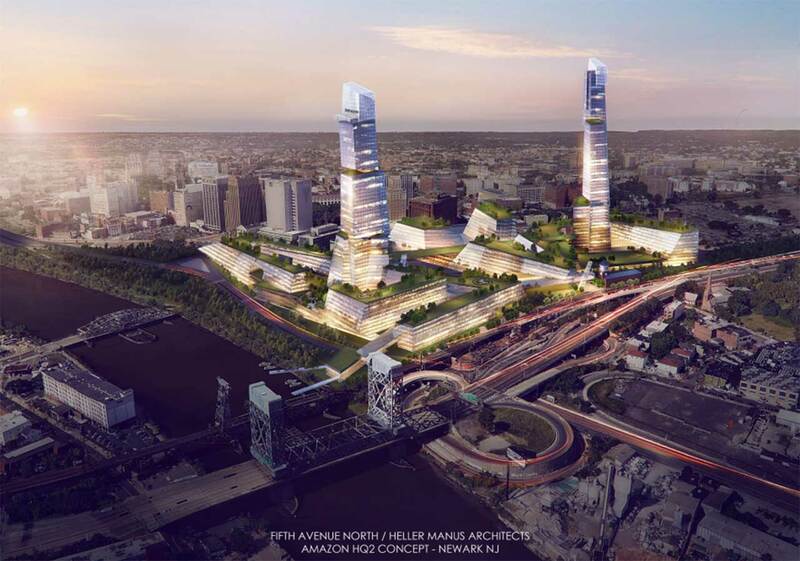 It would include a 60-story tower at the old Westinghouse site south of the Newark Broad Street station and a 55-story tower at the site of the Newark Bears and Eagles Riverfront Stadium. 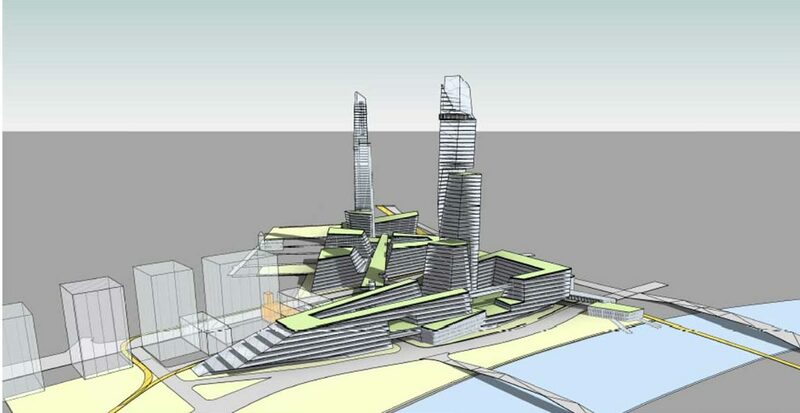 With a planned six million square feet of office space within, the two towers would be the city’s tallest. Smaller surrounding buildings would include a hotel, apartments and retail space as well as bike paths, moving sidewalks, solar panels, green roofs and ferry service on the Passaic River. Map of proposed site via Fifth Avenue North Partners. However, the properties where the new complex would be built are not owned by Fifth Avenue North, and the group’s proposal wasn’t part of the city’s formal application to Amazon in 2017. In fact, most of the lots in question are already the sites of proposed developments, though construction has yet to begin on any of them. Levin confirmed that the plan is only conceptual and no formal agreement has been made with the property owners or the Newark Community Economic Development Corporation (NCEDC), but that he has met with key stakeholders and is hoping the project will be considered. Lotus Equity Group is planning their Riverfront Square project–a hotel, a public plaza, apartments and multiple office buildings–on both the former Newark Bears property and the former Lincoln Motel site. 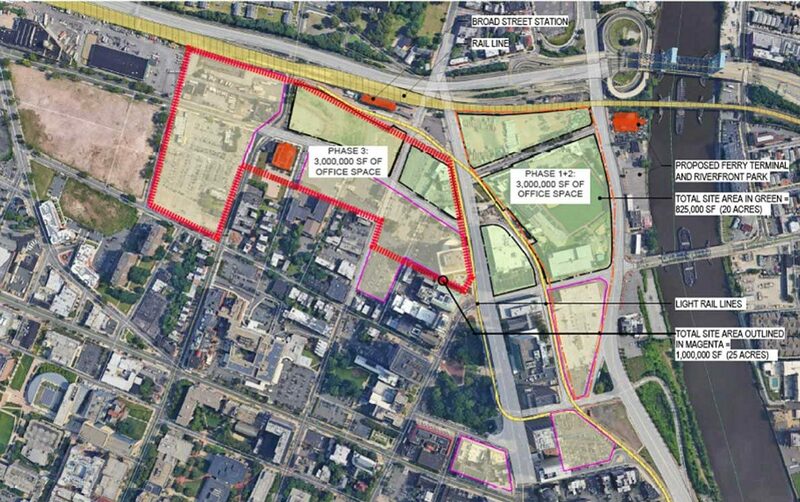 Plans for an office tower have also resurfaced for the long-vacant Westinghouse site. Newark’s 2017 Amazon application offered the Riverfront Square site as a possible HQ2 location along with the Matrix properties farther south along the Passaic River, undeveloped land surrounding the future Mulberry Commons park, the RBH Group’s south of Market Street properties and existing Central Business District office buildings.